She was going on about how she had some new planes she found at a swap meet, and, well, it made me want to go out and buy a plane. It's a winged quadcopter. Takes off vertically, flies fairly level, and I can chase the cats around the apartment with it. It's actually really fun, even if I can't fly it inverted or barrel roll or loop with it, and it's VERY easy to fly. When I bought my 'lil helicopter they also had one of those in the store.....I was torn!!! I only narrowly avoided a switch Air as well. Now when we buy planes we didn’t need we can say just it was Caroline’s fault! I'll tell you that the Switch Air is fun to fly. The only downside is that they kept the JST 1.0 connector on it, which fails after 20-30 uses. 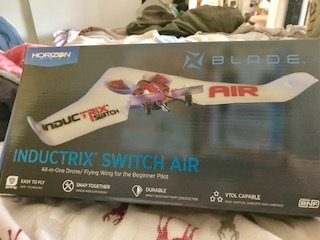 I'm going to perform "surgery" on it this weekend and swap it out to a JST 2.0 connector like I have on my NewBeeDrone Acrobee.and modded Inductrix Pro. It makes for a MUCH more solid connection, and I'm not limited to flying on the little 150 mAh battery that came with it. The FT team reviewed this product recently looks awesome. For how much did you get it? Totally great thread. Any plane purchase you make blame it on @CarolineTyler . We love you Caroline . Well...I got a "club discount" on it (Thanks John! ), so I got it for a little less than the MSRP, which is $50. It's not the best thing in wind, but it flies nicely outdoors! And, oh.... I know your pain @sprzout !! I figure if the wing gets killed, I'll turn it into one of the FT Hovercraft. Hah! I visited my Dad this weekend to finish building the FT Sea duck that a friend of mine got for us. I’m curious to see how this flies when I get home.